One of the finest secular rooms surviving from the Netherlands of the early seventeenth century, this room was originally located in the back of a house called Het Scheepje (The Little Ship), part of a brewery compound on the River Spaarne in Haarlem. The house may have been built by Dirk Dirick, a former skipper who was documented as its resident in 1612 and later became a successful brewer and a member of the town council. The room resembles the immaculate interiors depicted by Dutch painters of the period and would have been used for both living and sleeping (the paneled wall contains a bed-alcove behind the red curtains). This arrangement was common in even the prosperous households of the day. The focal point is the imposing fireplace, which features sandstone columns with figures of David and Judith, each holding the severed head of their vanquished foe (Goliath and Holofernes, respectively). As unlikely heroes who with divine help triumphed over stronger adversaries, these biblical figures can be seen as symbolic of the northern Netherlands, whose political and religious independence from powerful Spain was recognized in 1609. The fireplace tiles show children at play, boats, and birds. The ornamental elements of the oak woodwork on the mantlepiece and adjacent wall- the carved pilasters and masks and the inlaid ebony or ebonized wood-are of the sort popularized by late-Renaissance books of printed designs and decorative patterns. The furniture is of the same period as the woodwork while the floor is a modern replacement. The eighteenth-century stained-glass windows come from another building. This Dutch room is from a house that was part of the brewery complex in Haarlem known as Het Scheepje (The Little Ship). In the early seventeenth century the house was owned by Dirk Dirick, a former skipper who became a successful brewer and burgomaster. 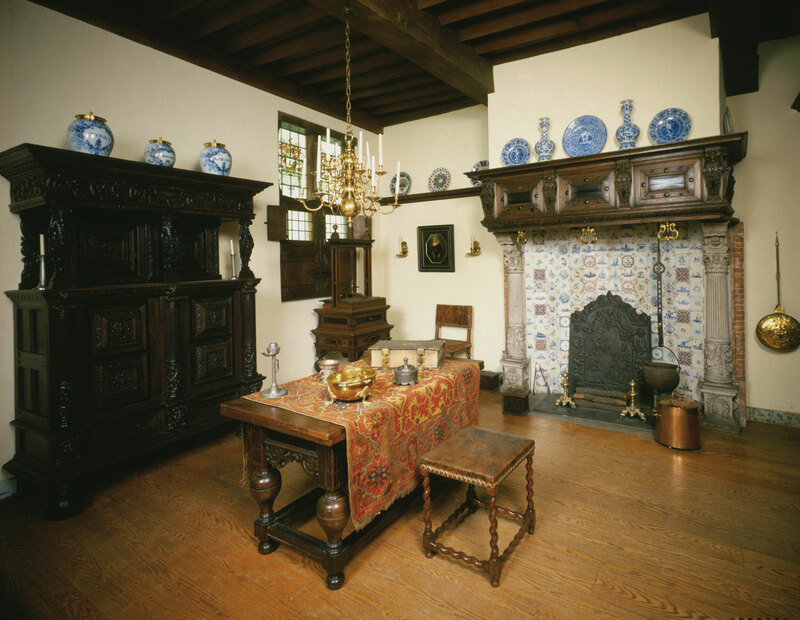 Located on the first floor, this room was used for both daytime activities and sleeping, for a bed is built into the wall facing the windows, a typical arrangement even in prosperous Dutch households. 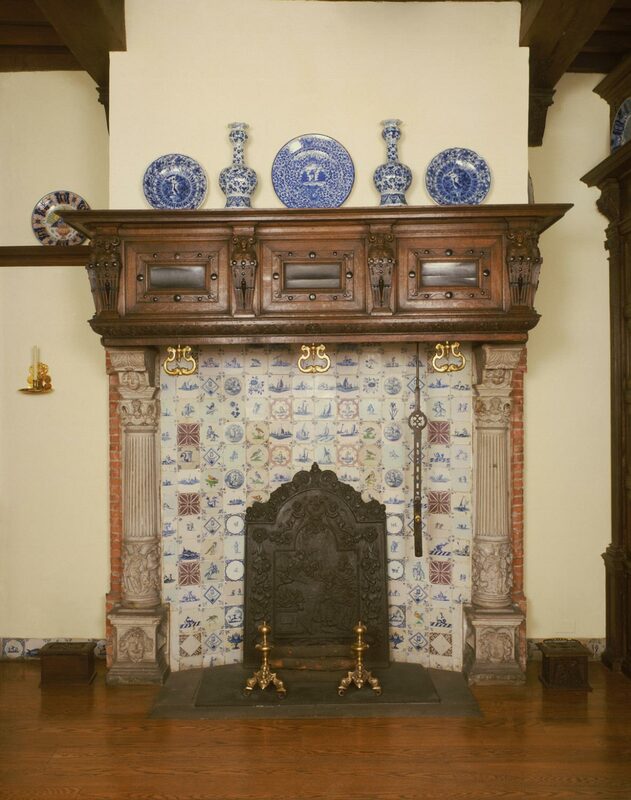 Tiles depicting children, boats, birds, and flowers line the imposing fireplace, while the oak mantelpiece and paneling are carved with ornaments, such as pilasters and masks inlaid with ebony, adapted from pattern books of the period. 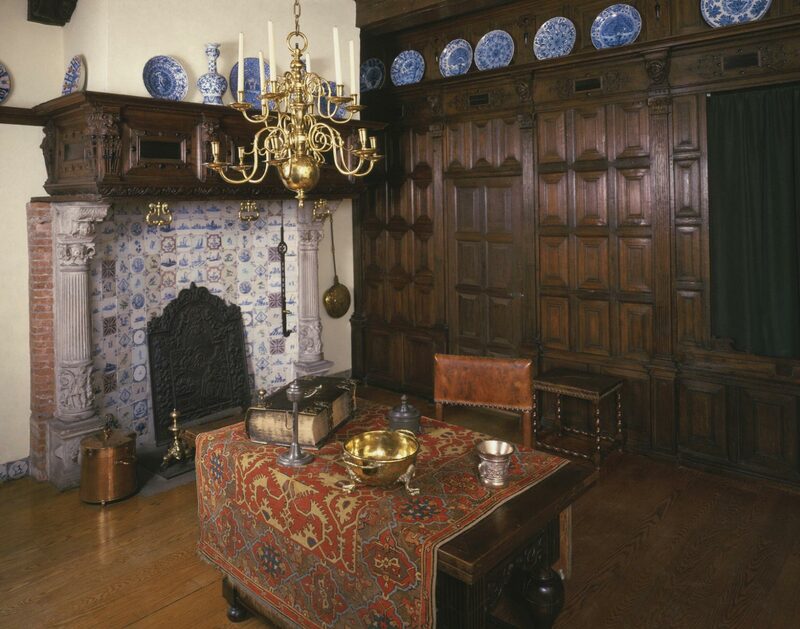 The table is from the original room, whereas the cabinet, linen press, and chairs, although not from the room, are of the same period and style as the woodwork. 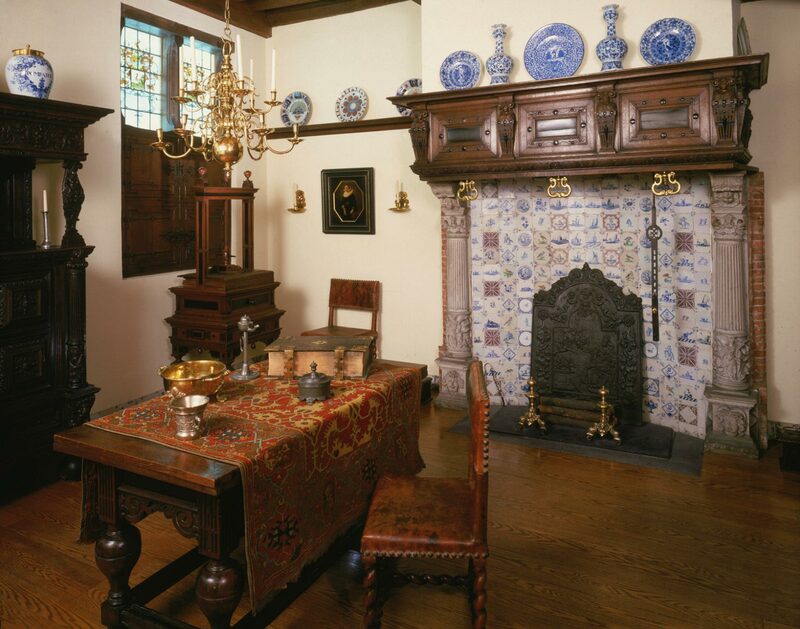 Ceramic, brass, pewter, glass, and iron objects contribute to making this fine example of a domestic interior from the Golden Age of Holland one of the most appealing and complete period rooms in the Museum. Eda Diskant, from Philadelphia Museum of Art: Handbook of the Collections (1995), p. 129.